A bar mitzvah, that’s what! Seriously. It was his birthday and my friend had never been bar mitzvahed. How could this have happened? I made it my mission to make sure my friend, once and for all, became a man. I consulted a Jewish colleague and she was overjoyed to help me through this process. She told me what to do, what to buy and where to buy it. She thought I was hilarious. I combed Ottawa for appropriate decorations. Turns out Ottawa doesn’t have much in the way of bar mitzvah decorations. I scored at the Loblaws College Square on Baseline. That’s where I got most of my goods. 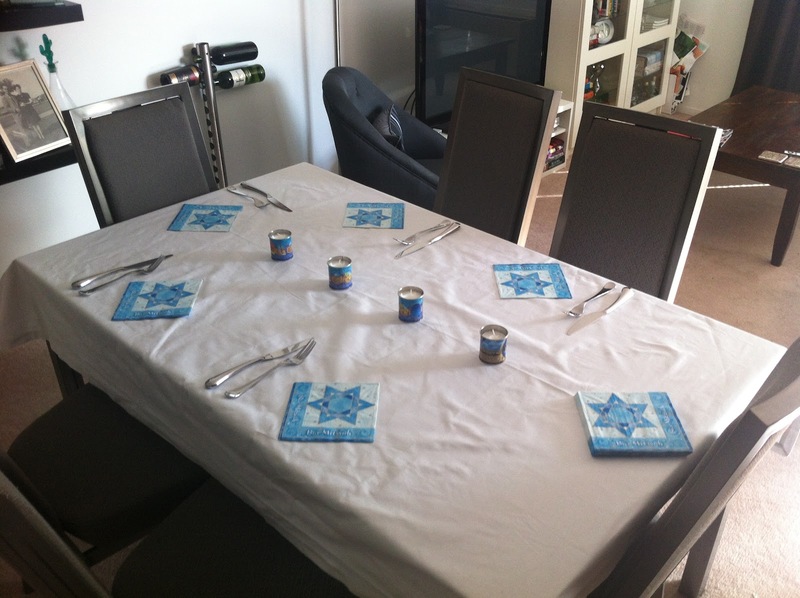 We didn’t read from the Tora, there was no Rabbi but there was definitely a celebratory meal. 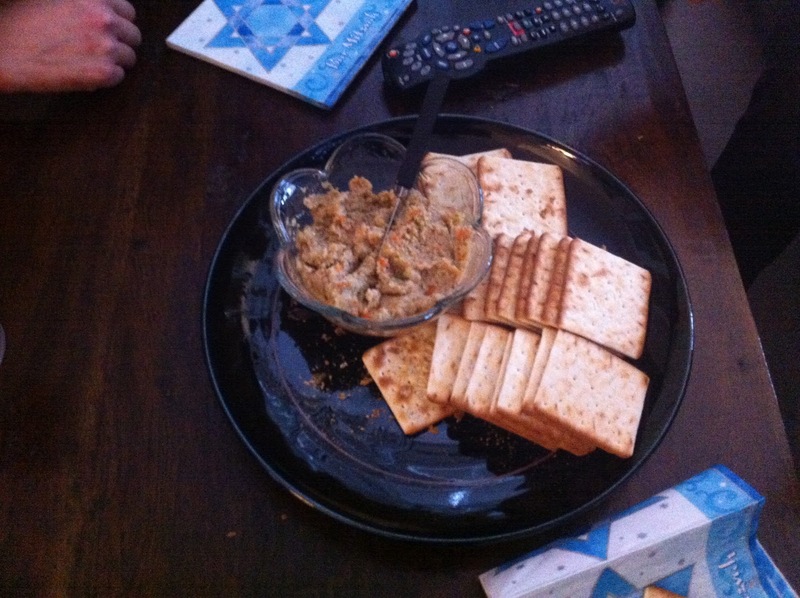 My friend Kath brought Gefilte Fish dip. Hmmm. Not my favourite flavour. 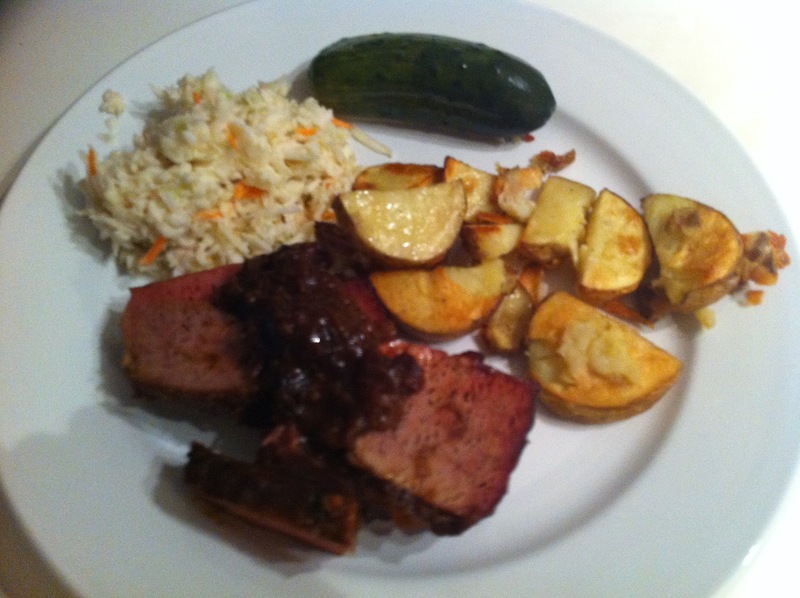 I made brisket with roasted potatoes, coleslaw and threw a kosher dill on the side. Not the best meal I’ve made, I have to say. I messed up the brisket. I purchased pickled brisket and then cooked it like a regular brisket. Pretty dumb. The best brisket I’ve had was at the 2nd Ave Deli in NYC and mine doesn’t even deserve to be mentioned in the same sentence. Now I know better and I’ll try it again some other time. My friends were ever so polite. But I know the difference between “this is good” and “mmmm this is soooooooo good.” The important part is that my friend finally came of age. Not bad for a guy in his 50’s! Sometimes life just gives you a day that you just can’t believe happened. AAB Day was such a day. 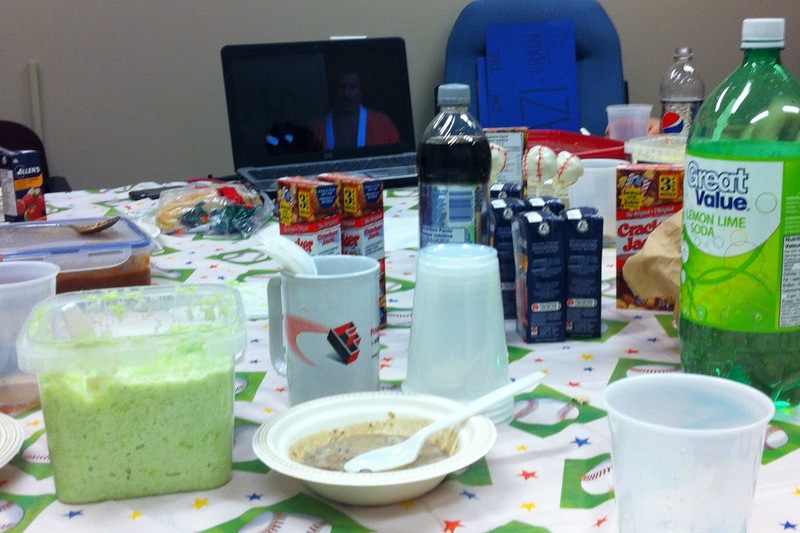 My employees had been scheming for a minute and I had not caught wind or tail of it. From the moment I walked into my office, it was one exercise in distraction after another. One wanted to catch up with me about my life, another wanted to talk to me about a recent project assignment. One employee led me into the boardroom user the guise of “needing to talk about something.” When the door opened it was clear what they were up to. 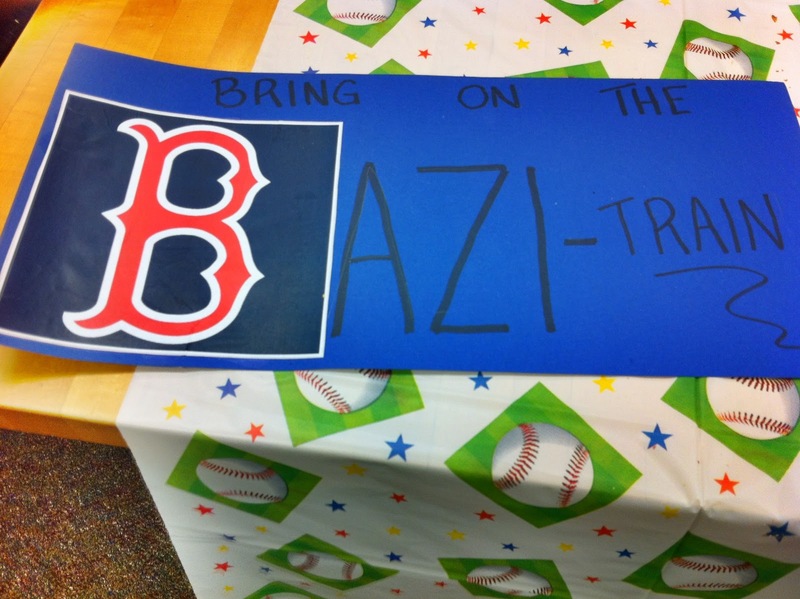 They had planned a baseball/Red Sox themed AAB Day (All About Bazi Day), a boss appreciation day. How lucky can one man get? From decorations, to food, to activities—everything was planned around my favourite sport and my favourite team. The lights were dimmed and a video of the Red Sox’ greatest hits was played. I’m glad the lights were out cause it all brought a tear to my eye. After a short break interrupted by work, it was time for food. 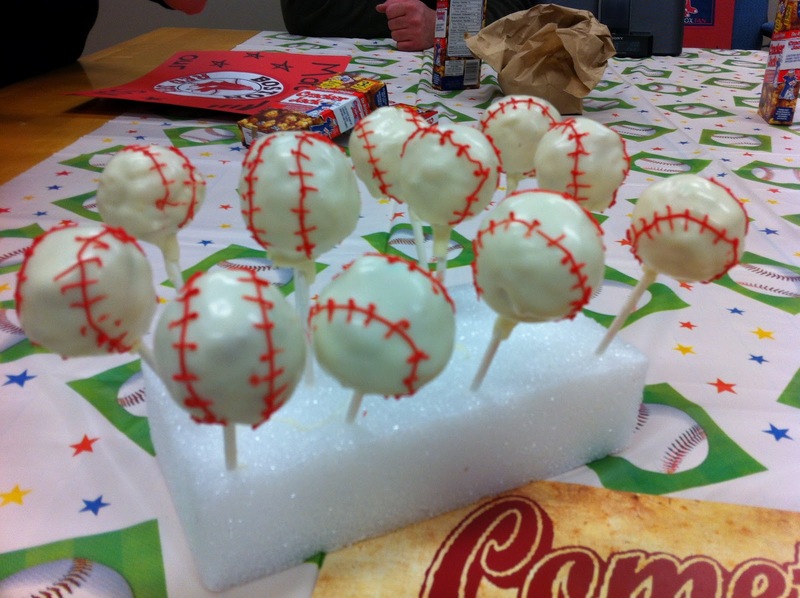 Chili dogs, coleslaw, Cracker Jacks, apple juice (my preferred morning drink), pop, ice cream and cake pops were on the ballpark inspired menu. Take note of the cake pops. Visually impressive and equally as tasty. Apologies for the long post but it was indeed a special day and I wanted to share it with all of you. My employees have very busy lives and the fact that they took the time to cook for me and create a day to thank me, well, it just means so much. I’m not sure what I did to deserve them, but I am very lucky to have them in my life. It’s not a day that I will forget anytime soon!